Tuesday’s Bold and the Beautiful is all about revenge. The past week has been tumultuous, filled with twists and turns, cover-ups and secrets for most people, but no more so than Sasha and Zende. We finally saw on Monday’s episode that Sasha figures out what it is that caused her to lose her job with Forrester. She was looking forward to her modeling job – mostly go get close to Zende – and she was under the impression that the man who hired her simply changed his mind. Who is she to question the boss when he decides to go another route. However, we saw Sasha overhear Nicole and Rick discussing the situation, and that is when Sasha realizes what truly happened. Her alleged best friend was jealous and did not want her spending any more time with Zende, so she played her trump card and had her fired. Furious, Sasha is not about to let this go. We all know that Sasha has always been manipulative and awful, and we simply cannot see her letting it go that her best friend – and half-sister even though Nicole does not know this – would do this to her. On Tuesday we will see Sasha’s plan for revenge begin to unfold. While we have no idea what all she has in store, we know that she has every intention on starting with Zende. She will do whatever it takes to have him for herself and hurting Nicole only makes the idea more enticing to her. After being brutally rebuffed by both Nicole and Julius, her real father, there is no way Sasha is going to allow this family to get away with their treatment of her. 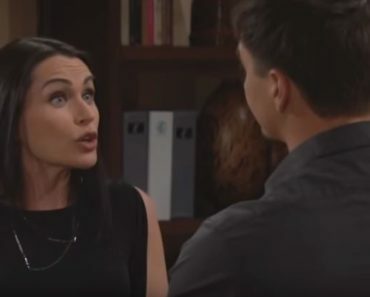 She will begin her plan to take down the family on Tuesday’s episode, and this brings us one day closer to seeing her ruin a family with her announcement that Julius is her real father. Liam fell recently on a plane. No one thought much about it at the time, but it appears that now he’s fallen again, this time in a parking lot with Quinn, leaving the world to wonder if perhaps there might be something more to Liam’s injuries than we thought. Was his fall on the plane just an accident and a coincidence that caused him more head damage that he knows, or could there be some sort of underlying health issue that is being brought to light by all his recent falls? Either way, Quinn is going to leave Liam where he is. After all, it makes it far easier for her to make sure Steffy falls for Wyatt if Liam is dead. Since Liam called off his engagement to Steffy, Quinn feels as if she already has the upper hand in this situation. We’ve been watching Nicole’s pregnancy take a huge toll on her behavior and her life, but will it finally prove to take her too far on Tuesday? It seems that Zende is out to figure out his life. He’s not sure how he feels about Nicole anymore after everything she’s been up to. He’s unimpressed with her behavior in her pregnancy, and he’s broken up with her. However, he will finally learn Tuesday that his ex is more than just a little hormonal and pregnancy-crazed; she’s actually just crazy. He learns that she is malicious and out to attack everyone in her way. While spoilers don’t tell us how Zende comes to this realization, we would venture a guess as to say that Sasha comes up with a very sad and desperate plea so that he views her as the victim and Nicole as the monster. It’s just one more way she can control her half-sister and ruin her life. Bill and Brooke and Katie continue their ridiculous charade; pretending that nothing has happened between Brooke and Bill while Katie just rants and raves and smiles all the time about her happiness to be working with her sister. Brooke and Bill are working to keep their distance at the moment, but they are failing miserably to prevent the secret looks, the tension and the sexual chemistry that they emit, so Katie will have to pick up on it sooner or later. After all, Liam is the one with the brain injury; not Katie.